Narcissus ‘Canaliculatus’ is now in flower in my garden – taking over from ‘February Gold’ and the exquisite ‘Thalia’. Note the name – from the sound of it, you would think it should be canaliculatus, analogous to Narcissus papyraceus. In other words a species, such as might be found growing wild in some stony outcrop in southern Europe or North Africa. But this daffodil is a hybrid, as the inverted commas around the name indicate. Hence it won’t breed true from seed. It has all the appearance of one of the species, however. Dainty and neat-growing, at 25cm (10in) tall at most, it produces tissue-paper-textured flowers that nevertheless stand up to variable April weather well. 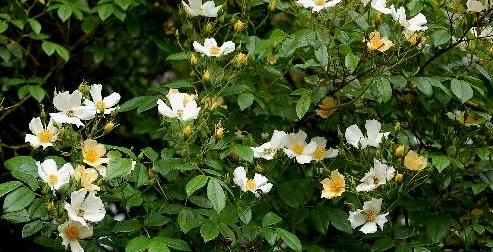 The trumpets, short and pale yellow initially, have now lengthened with age and faded to only a slighter darker cream than the backing petals. A pretty thing that I hope will bulk up in subsequent years. ‘February Gold’ must be one of the best of all the daffodils. True, there are a couple of others that flower even earlier, but they are not so freely available. I made a planting last October and they were in flower before the end of January and have only just gone over. I made a second planting at the turn of the year (garden centre bargain – all bulbs half price), and these began flowering only at the start of March. But they are still going strong. Next year, I expect all to flower simultaneously. Not only is this daffodil good and early – it also has considerable style. Admittedly the flowers are of the typical brassy yellow, but that’s a welcome colour on miserable February days when the usual snowdrops and hellebores can look a little pallid. What distinguishes it (for me) is its elegant habit. Dwarf it is not, the stems extending to a good 30cm (12in) or more, and the trumpets (technically coronas) are long and narrow, the perianth segments, or petals, nicely reflexing without looking as though they have been through a wind tunnel. And it is much more robust than it appears, standing up to heavy rain, wind and late frosts. I shall definitely be planting more later this year. 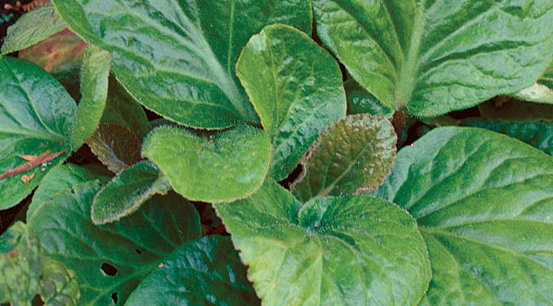 I was writing in my newsletter about Bergenia ciliata. Unlike the other bergenias, it has hairy leaves rather like those of an African violet (Saintpaulia) but much bigger. I acquired mine towards the end of last summer, so obviously it has not done much growing – and when it does start, progress is likely to be slow. It probably won’t flower this year, but this is a plant whose flowers are incidental – the leaves, up to 12in (30cm) long and 8in (20cm) across, are the main attraction. With undulating margins, they are puckered and covered in soft hairs. Despite their substantial texture, they are likely to be ravaged by severe winter weather. At present, mine is establishing in a small bed near the house. When I come to plant it out properly, it will need some shelter – I hope it will do well in a shady spot near my ancient apple tree. A plant I mentioned in my January newsletter – currently in flower in my garden. The parent plant – Clematis cirrhosa – is from the Balearics but is perfectly hardy in the UK. A harsh winter might cut it back, but it would recover. There are several other varieties, such as the ever-popular ‘Freckles’, with maroon-speckled flowers – but I prefer the plain cream one that I grow. Clematis are supposed to be good bee plants, though I have not noticed any, or indeed any other pollinating insects. Possibly an extended mild period is necessary before they become active. Unlike the later, more flamboyant clematis, this is a plant of subtle, subdued charm. 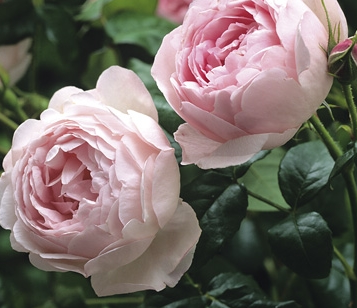 Any necessary pruning can be done in spring, just after flowering. The joy of climbers is that they present their flowers at, or just above, eye level, allowing you to inspect individuals, then inviting you to turn your gaze skywards – always a hopeful gesture. I have just been admiring the velvety pink flowers of the clematis ‘Mme Julia Correvon’ (see the entry for 31 July 2009) then, a little further on, noticed that those of the vigorous rambler ‘Wedding Day’ are just beginning to open. There’s a host of roughly similar ramblers that produce great clusters of single white flowers – ‘Bobbie James’, ‘Seagull’, ‘Rambling Rector’ (actually, I think two out of these may actually be one and the same thing) – but what distinguishes ‘Wedding Day’ is the buds, which are a delectable creamy yellow. Mine is now covering one side of my old apple tree (which manages to fruit regardless of the competition). Some of the flowers are already fully open, but its peak is yet to come. Even so, the flowering is brief – but spectacular. Some plants I have learnt to love only relatively recently, a case in point being this poplar. 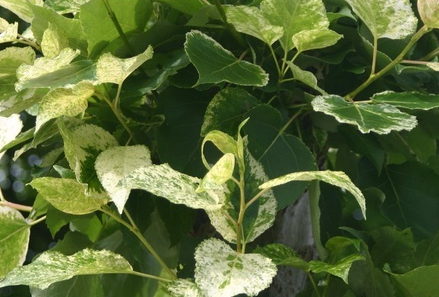 Its distinguishing feature is its leaves, which are not variegated in the conventional way – with an edging of white, cream or yellow – but liberally spattered over their entire upper surface with cream spots and blotches. Previously I thought they gave the tree a diseased appearance. But having come across an avenue of strictly pollarded specimens in the Haddonstone show garden (www.haddonstone.com) in nearby East Haddon, I now think they are rather pretty. The pair I acquired only recently have been giving me cause for concern, in that the young leaves are plain green. It is only as they are expanding that they are starting to show their characteristic markings. They repay study, as no two are exactly alike. Pollarding – a technique that involves ruthlessly cutting back the crown every year (or every other year) – is entirely appropriate therefore. It makes sure that all the leaves are at, or just above, eye level. It’s around this time of year that apple trees – and also pears sometimes – shed some of their fruits, a phenomenon known as the June drop. It’s as though the trees know how much fruit they can bear, so spontaneously shed the excess. Hence it’s nothing to worry about – but it doesn’t reduce the possible need for further fruit thinning. This is particularly advisable for those varieties that are prone to crop heavily, indeed to the point of exhaustion, leading them to take time out the following year, when there may be a very small crop or no crop at all – biennial bearing. 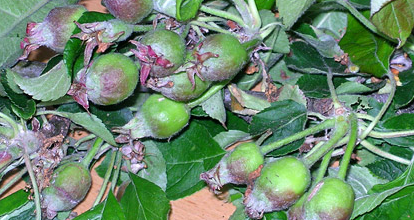 The simplest way round biennial bearing is to thin the blossom before the fruits even start to form. But now is a good time to look at all fruit trees anyway, just to see how the fruits are developing. If they are looking crowded, thin them. You may need to reduce the crop by up to half or even more. Fruits should be well spaced on the branches so that each can swell to the desired size without competition from its neighbours. Apart from producing bigger, more succulent fruit, fruit thinning avoids crowded fruits rubbing up against each other, which will lead to rotting where they touch and prevent even ripening. You can also shorten the new growth the tree has put on since blossom time to expose the developing fruits to the sun.